By Scott Horton, Founder, Delta Concepts Consulting, Inc.
I’ll never forget the weekend I spent in Salt Lake City about 15 years ago. I was learning and practicing a new training class from an innovative consulting firm with whom I partnered. During this “train the trainer”, friends and colleagues who do what I do (facilitate diversity and inclusion educational workshops) were sharing a lot of best-practice ideas. These were peers who had all been “out there in the trenches” (like me) delivering similar, potentially transformative workshops. We shared our successes and learned from each other. On the plane flight back east, I sat with my friend and colleague, Mercedes, an Afro Cuban woman. At the time, she was already an accomplished consultant. Mercedes knows her stuff and has the clients to prove it! During our airplane chatter, Mercedes took a deep breath and let me know she needed to share something with me. She described one of the “best practice” stories I had shared in Salt Lake City, reminded me of the praise I received from peers and leaders in the group. I explained that I had developed it from a series of “trial and errors” while facilitating the many workshops I had done in the past year. I remember a quiet plane ride from that point forward. My mind kept replaying her “accusation,” and even began to form judgments about HER that I had never thought before. We landed at our destination and said goodbye. About a week after this conversation, I had one of those moments that illustrates the expression, “It dawned on me.” Like the light of dawn, I remembered. Mercedes had shared this idea with me, at a moment when I had been frustrated and multi-tasking. I had simply forgotten where it came from. After I tested it repeatedly, I adopted the “credit” for figuring something out that was successful. None of this was intentional – but it did happen. I was an idea thief. How could this be? If you’re like me, you don’t listen to people the same way all of the time. We listen through filters of gender, age, ethnicity, accent and physical size. Our learned biases form an invisible network of filters that influences our listening to others. Most of us don’t have the same “listening” for our older white bosses, for example, as we do for a younger woman of color who is new to the team. Consider if this is true for you. I’m not talking about explicit discrimination here. I’m talking about subtlety that is invisible to the “perpetrator.” It’s hardly ever invisible to the recipient, in this case, Mercedes. She saw my lack of awareness and inclusion, and it was palpable, familiar and painful. The intent and the impact of our actions frequently don’t equate, especially when gender and culture among the players is different. But there are behaviors and actions we can practice in our “inclusion gym” to prevent an inequity or unintentional slight to our colleagues, like what happened between Mercedes and me. Assume positive intent.When giving or receiving feedback about your behavior, or the behavior of another person, try to presuppose that the other person means well. Give them the benefit of the doubt. Give credit where credit is due.Affirm your colleagues when they share an idea. If someone co-opts that idea in a meeting, circle back and remind the team where the original idea came from. Be willing to explore and acknowledgeOur invisible biases around race and gender and other diversity dimensions influence how we listen to each other. 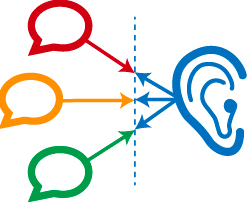 When partnering with someone who is different from you on one or more dimension, double up on active listening and pay more attention to their contributions and ideas. Acknowledge when you are wrong.As soon as you realize you have inadvertently let filters blind your actions, accept responsibility and communicate this to the person who may have been hurt. Now is the time to look inward and see what caused “filter blindness.” Were you paying attention to what they said? Did you dismiss their ideas because of implicit bias? These practices work. I know, because I’ve been exercising them since my “Mercedes accident,” and I’ve gotten feedback on my intent listening from many women of color since then. You CAN teach an old dog new tricks. I’m proof.